Skiathos town is a busy, cosmopolitan town during the summer months. Walking along the quayside in the evening is lovely as there are some amazing boats owned by the very wealthy. Many rich and famous people are often in the town. There is a vast array of tavernas and restaurants from which to choose. Our favourite, for a special evening, is the Windmill Restaurant. This is reached by climbing up a lot of steps but this is worth doing for the stunning views of the town at night and the harbour. Transprt to beaches is easy - there's a regular and frequent bus service and a water "taxi" which will take you to a number of beaches along the south coast. The lovely beaches on the north coast can only be accessed if you hire a car but this is well worth it. We absolutely loved Skiathos, it was our second visit to the island. The previous time we stayed in Kolios and much preferred to stay in the town and catch the bus out to different beaches each morning, rather than stay out of town and try to catch the bus in for the evening. The only downside we could say about the town is the motorbikes/scooters that scoot up and down the alleyways. We stayed close to the top of Papadiamantis Street so it was very convenient for bars and restaurants as well as bus stop no 4 to get to the beaches along the coast. As it was only the second week of the season, a lot of the beaches didn’t have their sunbeds out – including Banana Beach. So we caught the bus to bus stop 16 (Ag. Paraskevi) and went to the beach near the Skiathos Princess Hotel. This was very quiet and we were allowed to use the hotel sunbeds for free if we bought a drink or two – not sure that this will be the same at busier times. The hotel’s own taverna wasn’t open, they were getting it ready for opening towards the end of our stay. There’s a really nice taverna right at bus stop 16 called Orsa, we left the beach and had lunch there most days. Great spag bol, Moussaka, soutzoukakia (although this came with frozen chips which was a shame), typically paid around €21 to €23 for 2 main courses, litre of house wine and a beer. The town is made up of winding alleyways that are great to explore. In town some of the bars were very quiet, we often had drinks at a restaurant called Dino’s which was smack in the middle of Pap Street and great for people watching. The people who ran it were great. We would definitely choose to return to Skiathos but would always want to stay in the town. Skiathos Town is gorgeous. Loads of shops, restaurants and bars. One of the classier Greek islands and caters for all ages nightlife-wise. Lovely harbour for walks and there's the forest walk also, at the other end of town. Will be back for sure. Having been to more than a dozen Greek islands so far and enjoyed them all I'd certainly recommend Skiathos for a first time Greek island goer and for those who did the usual island hopping of the more basic islands in their youth Skiathos is the next step up. 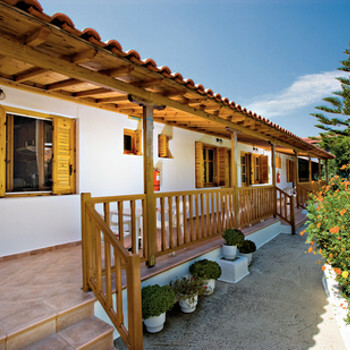 Skiathos where ever you go is a wonderful island, the apartments are very basic, but very clean. The people in Skiathos are very friendly and I would go back there again and again. What a lovely place to holiday and wind down. Skiathos town is a great base to stay.Its easy to take a water bus or bus/taxi to everywhere from there. Skiathos is a fantastic island! It was our first visit and Skiathos had been recommended to us by my parents! We stayed in Skiathos town, there are endless amounts of taverna's, all serving excellent food and lots of bars/lounges with comfortable seating, overlooking the old and new harbour! There are so many beaches to visit around the island. We hired a 600cc crosser motorbike for the week costing just over £90, and what a great week we had! There are so many car/bike rental places to choose from, or taxi boats are also a great way to travel...or if you don't fancy either of those, there are bus stops all the way around the island offering a regular bus service! If you collect a free Skiathos map from the airport, you can't go wrong! We went on a boat trip for a day and visited some amazing places to swim, we also enjoyed wine and a buffet lunch. It was very relaxed atmosphere,there were only 10 people in total on the boat and we had a great time! We sailed to a beach that can only be reached by boat, where last week "Mamma Mia" was filmed! We had great weather all week but on the last night there was a big thunderstorm, we had to run home in bin liners! We visited both monestry's and most beaches, we would recommend Koukounaries beach for watersports! All are picturesque but some are easier to get to than others! The views are spectacular! Skiathos is a very classy, traditional Greek island with lots to offer for all! Highly recommended! Food, restaurants, people and beaches were all excellent. The Roof Top Bar is a must. The owners are from Huddersfield? Very frienly and welcoming and love to chat with visitors from home and if you like John Smiths beer then definatley go there. Dinos is another must, such lovley people. Second time we have been although eight years inbetween visits but just as beautiful as I remembered it the first time. Wont be eight years before we go back thats for sure! A beautiful resrt & Island. We would not hesitate to reccomend Skiathos & Skiathos Town. Great beach (Megli Amos), Great Bars on the old harbour front & in the old port side of town (Rooftop Bar, King & Queen, The iold Port House, & also numerous resteraunts, Including Marias where you may have a wait for a table but the food & wine was excellent. The resort of Kolios is small, it was very quiet when we were there, with not a lot going on, some of the hotels and apartments were still closed. It was very handy being by bus stop 13, but because we went early in the season the buses were running to a winter timetable, but there is a very good taxi service which cost us 4 euros to Skiathos Town and 5 euros to Koukanaries Beach. If you stand at the bus stop the taxis just pull up and say 'special price!' The beach at Vromolinos and Kolios were a short walk away about 10 mins but no facilities early season. There is a nice walk around Kanapitsa peninsula by bus stop 12 about a 2 hour walk. The resort is approximately half way between Skiathos town and Koukanaries, making it convenient to visit anywhere on the island. We hired a jeep for 3 days, but wouldn't think this necessay in the main season when the buses and running more regularly. We would visit this resort again, this was our second visit to Skiathos.